This applies to a Metric Insights instance hosted on VMware (CentOS linux) where the web SSL certificate has not been signed by certificate authority (CA). For Metric Insights instance hosted on Amazon EC2 (debian linux) see this article. 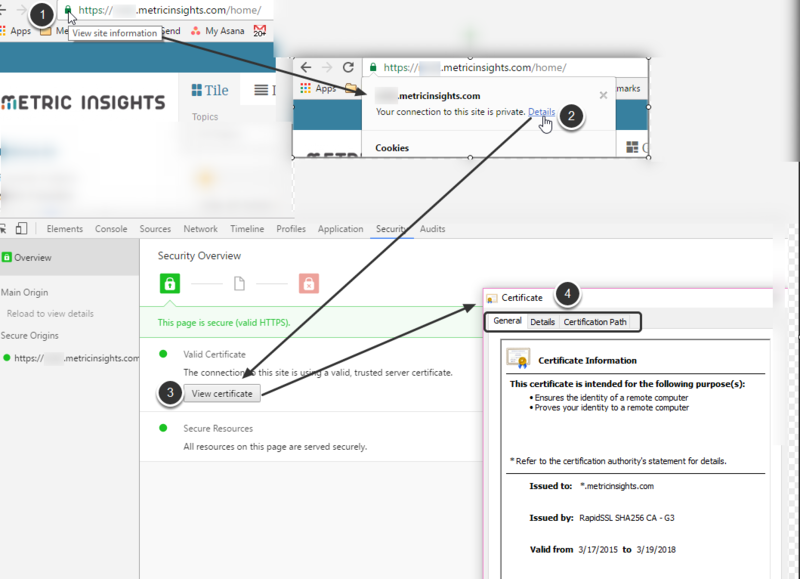 This article discusses how to set up web SSL certificate for Metric Insights. When running Metric Insights in VMware you will typically see this upon reaching the site for the first time. Depending on the browser you can just accept this SSL certificate warning and continue using Metric Insights. However, if you need to have a valid SSL certificate then this article walks you through the steps. ** 'Challenge Password' - leave the challenge password blank, otherwise someone will need to enter a password whenever they start up Apache. Not good for automation. Once you have answered all the prompts, your private key (your-machine.key) and CSR (your-machine.csr) files will have been created in the directory you ran the command in. Provide the CSR file to your certificate authority. Many large companies will have their own internal signing authority while others will use one of the many commercial public trusted CAs on the market. Ask the IT or System Administrator in your organization if you are unsure. If you do not know, whether or not you need this, you can safely ignore it. Next: How do I specify a domain name when connecting to SQL Server?